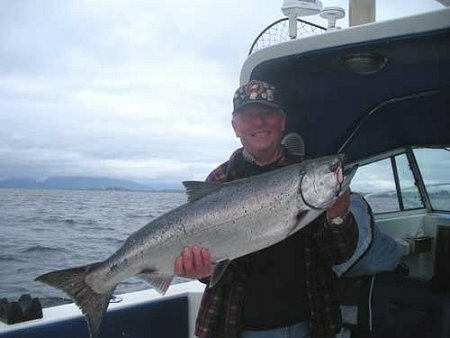 29th May, 2010: FISHING REPORT: Ucluelet , British Columbia, Canada. by Sam Vandervalk of Salmon Eye Fishing Charters BC's Sport Fishing Experts. 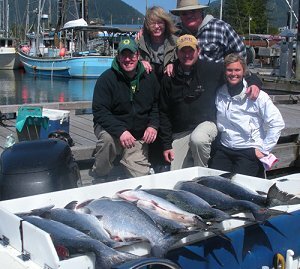 The salmon fishing on the west coast of Vancouver Island continues to impress us in 2010. We knew the fisheries’ forecasts had us catching more salmon than in years past, but we didn’t have any idea just how good it was going to be. Media reports in Washington, Oregon and California had many people wondering if fishing was any good up North. After all, if fishing was so poor south of the border, how good could it possibly be just a ways north? One thing I want to clarify for all American readers, Vancouver Island is much different than Vancouver. Vancouver Island is 350 miles long and 150 miles wide at the widest point. Fishing on the west side of Vancouver Island is much different than fishing around Vancouver. Many people read about fishing around Vancouver Island and then plan a trip to Vancouver, not realizing that Vancouver Island is a 1.5 or 2 hour ferry ride away depending on which ferry you take. If you want to go salmon fishing in some of the best area you can go in the world, make sure you plan to go to the west side of Vancouver Island and not just Vancouver. 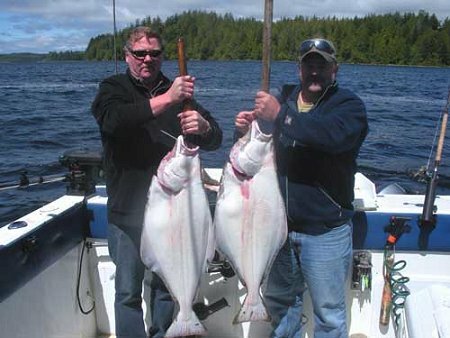 The rugged west coast of Vancouver Island has always produced great fishing, however, the fishing spots have changed there over the years. For years the sport fisherman would fish in close to shore and the commercial fisherman would fish 20 miles offshore. Over the last 20 years with changes in technology sport boats are venturing out where commercial boats once fished. With changes in ocean temperatures and bait feeding areas, many salmon no longer came to feed in the in-shore areas but preferred to stay out where there was more and larger feed. Salmon will almost always go where there is larger bait fish and therefore will mostly feed offshore if that where the larger bait is. Areas such as Winter Harbour, Ucluelet and Port Renfrew have continued to produce good amounts of salmon even when salmon fishing slowed down in 2008. Last year most of the coast experienced a return to good salmon fishing and this included the Queen Charlottes. Since I am a fishing guide in Ucluelet, we will hear reports of where large salmon runs are coming down the coast. Salmon will often travel 30-50 miles a day when coming down the coast, so you are rarely fishing the same runs of fish from day to day. In our area, we will have large schools of salmon from many different rivers around. Because we are not dependant on one or two rivers returning salmon, we have very consistent fishing all summer. In 2010 the salmon returns were predicted to be very large in a few rivers around us and therefore we knew we were going to see a good season—we just didn’t know it was going to be this good! We started catching salmon very close to the Ucluelet harbour during March, April and early May. We were often limiting out in just a couple hours with 6-10 Chinook (Kings). Now the salmon are mostly offshore and we are getting salmon and halibut in the same spot. Often this time of year we see Chinook from 6-10 lbs with the odd one around 25 lbs. This year we are averaging Chinook (Kings) from 12-15 lbs and getting a few in the high teens and low 20s. We are getting so spoiled with fishing this good, but I think it will continue all summer! When I first fished for salmon in Ucluelet, I came out with my brother and followed a friend in another boat to the spot from the day before. We saw him get a fish on right away! We furiously tried to get our lines down so we wouldn’t miss out on the bite! Two hours later with 4 Chinook between 25-35 lbs and having released about 20 Chinook I realized this bite wasn’t stopping. It was the best fishing I had ever had and since have come to realize that fishing out of Ucluelet is so much better than almost any other area along the coast. Locals here take it for granted and when asked how fishing is will give their view based on their experiences in Ucluelet, not comparative to areas along the coast. So often, a slow day in Ucluelet is someone else’s good day! I know from now having guided at a few different places along the coast and then here for the past 6 years. For more information on salmon fishing on Vancouver Island check out www.salmoneye.net and for our fishing blog check out www.salmoneye.net/blog/ . Tight lines and hope to see you in Ucluelet!